Rated 4.9 out of 5 stars.71 total votes. Urban Walls make all kinds of removable Wall Decals and Chalk Decals for homes. Wall Decals are inexpensive compare to wallpaper and easy to pop on a wall and easy to remove without leaving any damage to your wall. Perfect for renters!!! Wall Decals adhere best to Matte, Eggshell, Satin or Semi Gloss Paint. They do not recommend installing on a surface with highly textured concrete/stucco or a drywall/primer finish. 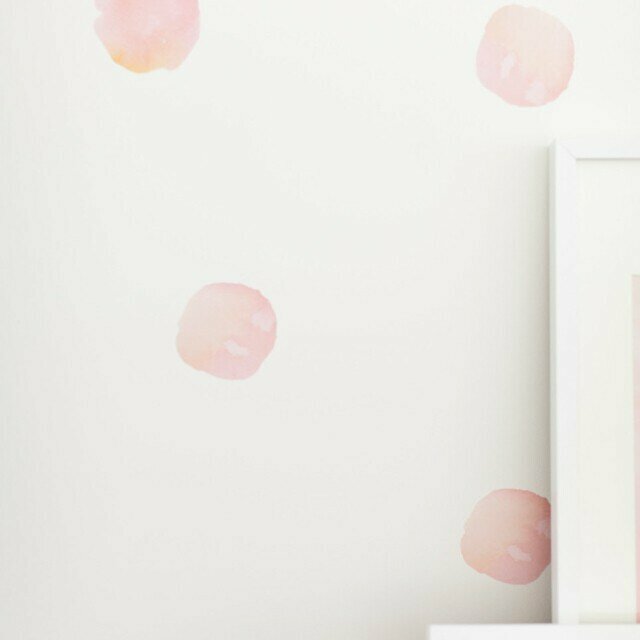 When you buy a Urban Walls Watercolor Dots Wall Decal online from Wayfair.ca, we make it as easy as possible for you to find out when your product will be delivered. Read customer reviews and common Questions and Answers for Urban Walls Part #: URWA1652 on this page. If you have any questions about your purchase or any other product for sale, our customer service representatives are available to help. Whether you just want to buy a Urban Walls Watercolor Dots Wall Decal or shop for your entire home, Wayfair.ca has a zillion things home. ADORABLE ❤️❤️ such a cute touch to my daughters bedroom. These are so cute and very easy to plan and apply! Love These. Easy to use and move around with no damage to the walls. Love love how these turned out! These are super fun for a playroom. Covered one whole wall and still have some left over. Love the color variation and how easily they remove. These look great. Super happy with our purchase. Only giving it a four as I do find they were a little expensive. Also- take the advice to tape them to the wall before committing to sticking! Very easy to install and they look very cute. They are a bit bigger than I thought but overall very happy with this purchase. This beautiful pastel wall kit has both style and charm. Make your own confetti wall or arrange in a design of your own for a fresh pop of colour in any room. Preposition and always removable, these 60 peel and stick dot decals make a happy chic statement. Comes on 4 sheets. Your dots decal pack comes all on one sheet. Simply cut the dots out and place the decals where you see fit. This is an affordable way to decorate your child's room, or any fun room in the house. Select the colour you would like for your vinyl wall decals pack. Create a happier wall one drop at a time. Chances are the kids will be dancing with joy. Your raindrops will give new character to a boring wall. Includes 37 raindrops. The Mixed Patterned Dots Wall Decal add more fun to kids’ rooms and a touch of playful whimsy to modern vintage-styled rooms. These fun multi-size polka dot decals are the perfect addition to any kids room, playroom, nursery, living room, or bedroom. Polka Dots, a classic beautiful way to decorate any room. Nursery, bedroom, family room, or office you can do so much with our simple, elegant polka dots wall decal. Rated 4 out of 5 stars.8 total votes. Create a fun and inviting space for your baby or kid's room with Trendy Peas colourful Confetti wall decal. Includes 28 confetti dots. Rated 3 out of 5 stars.3 total votes. Lovely, stylish designs for babies and children. Wall decals, easy to instal and to remove, damage free, can be used on wall, furniture, appliances, mirrors, etc… A design is printed on white vinyl and then cut out. This allows ADZif to create unique patterns in a wide range of colours. Application is effortless: Peel off the backing and stick the decal on the wall. Large-size decals or those with a delicate pattern may sometimes come with a transfer tape for easy application. All ADZif decals are easy to remove and, even after many years, will not leave any residue on your walls.